Here are the factors you need to consider when choosing a digital label printing company. Have you heard of digital label printing? It’s a hot new trend because of the flexibility in graphic design changes, textile options, and more. Although popular, getting quotes from digital label printing companies can feel like a daunting endeavor, especially when you’re not sure what to look for or what you need in a quote. Here are ten factors to consider when talking to the digital label companies so you can be sure to get consistent quotes that won’t lead to surprise charges down the line. One of the biggest perks of digital label printing is the ability to change graphics. This is especially beneficial if your product makes small changes on a regular basis, such as changing a year on a wine bottle or a sku on a small-batch food product. Ask about the run sizes available to you so you can gauge what you’ll get for the price you’re quoted. Traditional forms of label printing took weeks to deliver. Digital labels are able to be printed in a matter of days. This can be a tremendous help if you’re planning seasonal or limited edition products. Ask about the printing speed when you’re requesting your quotes. You might also want to ask about the design and management process so you can accurately gauge how long it’ll take to get your labels from start to finish. There could be clogs in the production system that you’re not aware of up front but will impact your ability to get your current print run and future print runs to market in a timely manner. Do you often find that you have excess numbers of labels printed that go to waste after sitting in storage for too long? Digital might be a better option. In general, overrun costs are significantly less with digital than with traditional printing. This is because short run labels total costs are often higher on traditional flexo printing because of the need to prepare plates. If you have several SKUs, the lot fee can be astronomical. With digital printing, there are no plate fees so the cost is often much less on short runs and on multiple sku products. Ask the companies you’re requesting quotes from to include side-by-side quotes so you can compare total costs. One of the biggest benefits to digital label printing is the ease in printing a variety of skus without skyrocketing the cost. Ask your printer about the costs for each of your different skus. If there’s limited variety in the graphic changes outside of your skus, you might be surprised at how much you’ll be able to save. Are personalized labels part of your marketing plan? They are for a lot of food and beverage companies, including Nutella, Coca Cola and Budweiser. If you’re offering personalized packaging, you will benefit from having the flexibility of digital printing. Let your printer know up front that this is in your marketing plan so you can get a more accurate price estimate. There is a downside to digital printing. If you want to add any special sensory effects, such as die cutting or embossing, you might not want to choose digital printing. Talk to the label printer to make sure you get the exact look and feel you’re after. Another common trend in digital label printing? Starting on digital and then switching to flexo printing as your volume grows over time. It may make you beg the question, is digital or flexo right for your printing needs? Ask your printer about any anticipated printing technology changes. This could impact your proof copies and production runs down the road. Digital printing can sometimes produce slight variations in color schemes. Digital print is usually made out of CMYK (process print) and not pantone or metallic colors. Sometimes the conversion from solid to process printing is not equal. Ask your printer about doing a test run on digital so you know what to expect with the varied substrate and processes. Are you planning on selling your products overseas? If so, you might need to print your labels in different languages. This means there’s little change to the overall aesthetic of the label but you still require two separate printing runs. You’ll likely have to start with smaller volumes of the international labels at first. Talk to your printer about this so you can get a feel for how much you can save on multi-lingual printing. Like any printing process, unexpected costs can arise. Sometimes, printers can anticipate these costs internally but they don’t always discuss them with the client until it’s too late. Be sure to discuss all the application conditions with your printer and then ask about the potential for any hidden costs you should be aware of in their process. 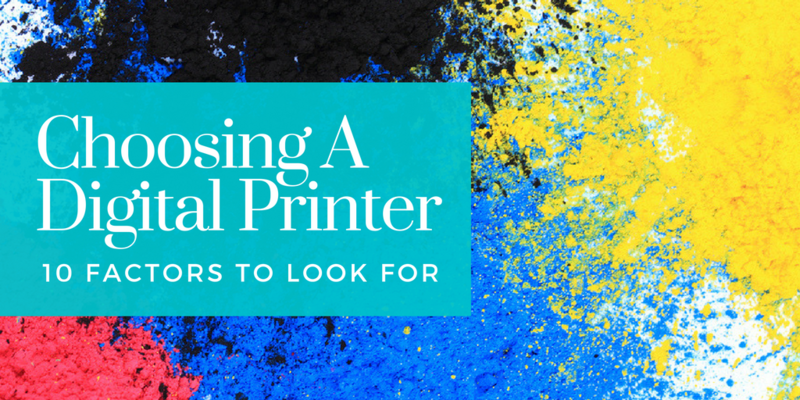 Question: Have you considered digital printing? Digital is getting a lot of attention because it’s more cost effective for brands that need to make subtle and small tweaks to their labels. Although quite popular, it’s still relatively new, which means there is still a lot of confusion around this type of printing. By knowing what to look for when you talk to printing companies, you can get more equitable quotes to compare. We’d like to be one of those quotes! Contact us at 877-836-8337 for a no-pressure quote and to discuss your digital label printing needs.